Shine-ink jewellery inspired temporary metallic tattoos are fabulous for the beach, a night (or day) out on the town, festivals and concerts. 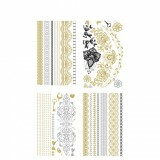 Each Shine-ink Temporary Metallic Tattoos pack consists of 4 assorted sheets (size 10 x 21cm) of temporary tattoos for you to create your own unique designs. 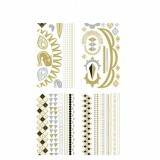 Shine-ink Temporary Metallic Tattoos last 3-7 days depending on where they are placed. To care for your Shine-ink Temporary Metallic Tattoos avoid sunscreen, lotions or oils near or on your temporary metallic tattoo. Oil based substances will affect the adhesive.